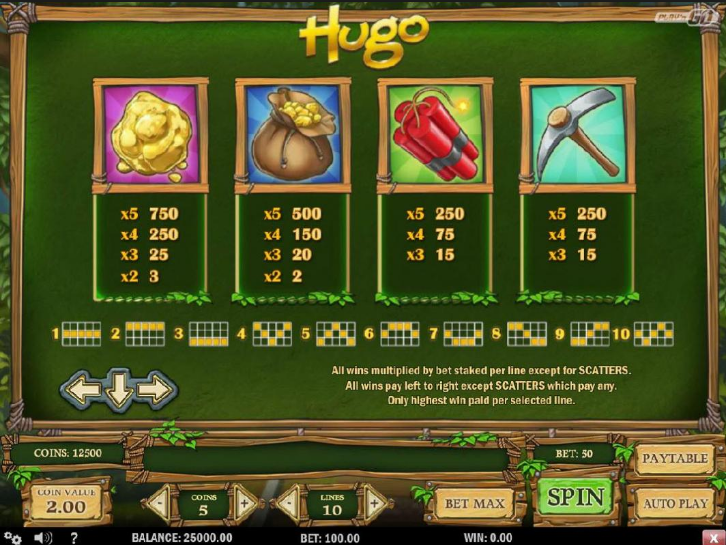 Hugo is an interesting slot game, which rewards you with many coins. The game is based on the Scandinavian TV show about the friendly Hugo Casino Slot. 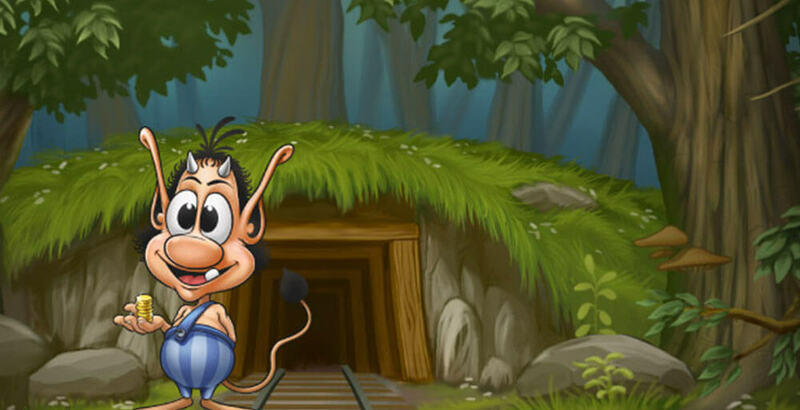 It was created in Denmark, but it became very popular in the 90s, and today there are many games based on it. In this game the main aim of Hugo casino slot is to dig up the treasure and save his wife, Hugoline, from Don Croco, the evil crocodile, and the evil witch Afskylia. As you follow Hugo’s quest, you may have some fun and get coin rewards. If Hugo, as a Wild symbol, is a part of a winning combo, it doubles the reward. You can play for free and have some fun or earn some extra money. Play’nGO, a Swedish company that is entertaining players all around the world, created the game. Hugo is very much like a cartoon, and the animations are very interesting and colourful, especially when there are winning combinations. The music sounds adventurous and it really gives the feeling that the action is taking place in a gold mine. There are many mining sounds included in the game that once could hear on the original show. As with most slot games, Hugo is a 5 transparent reels and 10-payline slot game. Whether you are playing a demo version or for real cash, you can choose how many of the 10 paylines you will activate. You will also have to set your bet. More paylines and higher bets will bring you higher rewards. The value of coins varies from 0.01 to 2, while the number of coins goes from 1 to 5. The minimum bet is 0.01 and the maximum bet is 100. You can manually spin the button every time, or activate the autoplay and wait for the reels to combine automatically. The autoplay mode can go from 10 to a maximum of 50 spins; you can also check the other settings this feature offers, and make the game even easier for you to play. The game has a mix of high and low payouts, and the rewards are automatically added to the game balance. Great rewards come from the Free Spins feature and Treasure Bonus, which eventually pop up. Like many other great Play’n GO games, you can expect to find an RTP of over 96%. Hugo casino slot game has 13 symbols that may bring you great coins rewards. To win, the symbols must be lined up from left to right. You need to get a minimum of three symbols combined, to a maximum of five. The more combined symbols there are, the higher the reward. Three main symbols bring more fun and great rewards to the game. Those will be the ones you will be waiting to combine. Three chests with gold activate the Treasure Bonus game. 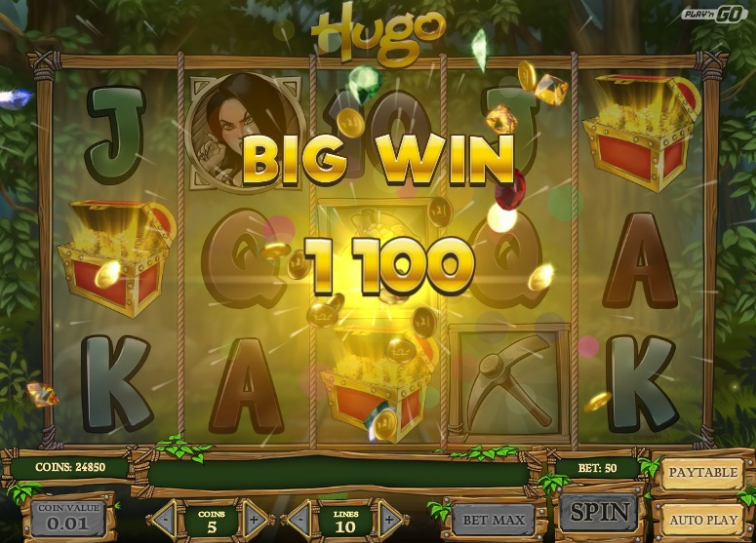 Hugo casino slot, as a Wild, doubles all wins and is a substitute for all symbols, except Bonus and Scatter. Hugo casino slot game helps you create a winning combination. 5 Hugo symbols will reward you with 2000 coins. Three symbols of the evil witch, which is the Scatter, activate the free spin. The other 4 high-paying symbols you should be watching for are the ones in a wooden frame, such as gold and gold bags, digging tools, and dynamite. Less worthwhile but not without the possibility for some winnings are all the letter symbols A, K, Q, J and number 10. The maximum win you can expect from the game is 100,000 coins. Additionally, Hugo slot game offers two bonus games: a Free Spins feature and Treasure Bonus. If you get 3 or more symbols of the evil witch Afskylia, you will have the opportunity to play some Free Spins. As soon as the feature is activated, you have 3 options to choose from. There are 5, 10 or 15 free spins with great cash rewards. Each option gives you different rewards. The less free spins you take, the bigger the multiplier is. If you go for 15 free spins there will not be a multiplier. There is a possibility of retriggering the feature and win up to 10,000 times your stake on each free spin. This is where most of the winning combinations come from. The Treasure Bonus Feature activates when you see the chest with the gold symbol on the first, third and fifth reel. When Hugo gets into the mine you have to choose the doors for him to take so that he can reach the chamber full of treasures. Some of the doors will reward you with coins and take you to the next section, where there are other doors to open. You will have to open three doors until you reach the great treasure. By opening the right door, you can get a huge win up to 500x times the total bet. However, you have to reach the treasure chamber unnoticed, for behind every door there could be Don Croco, who by kicking you out the door will end the Treasure Bonus feature. Hugo seems to be a very interesting game. It is like most of the standard slot games, but there are wins up to 10,000 times your bet. The big wins come from the Free Spins and the Treasure Bonus, and chasing these features can put some extra cash in your pockets. This looks like a perfect way to earn some money while having fun. For people who like to play on the go, the game also has a mobile version and it can be played on many devices. Let the friendly character of Hugo guide you around this game and help you to enjoy the play.